It’s easy to take the benefits of being fluent in the English language for granted. Stop and think for a moment on how your life would be different if you struggled to understand and communicate English. Getting through what you consider to be a simple day would become challenging. You’d be handicapped in your ability to make friends. Whenever you encountered a new and challenging task, you’d be hard pressed to find, either through relationships or online, the help you needed to complete the job. Your opportunities to acquire meaningful, sustaining employment would be greatly limited by your language barrier. What’s it like being an ESL teacher? That’s exactly the position in which more than 2.5 million school-aged children currently find themselves. Children who speak a language other than English at home enjoy the cultural richness of their heritage but lack the opportunity to have their emerging English language skills reinforced at home in the ways their English-speaking counterparts do. These students often find themselves struggling to decode English, and often find themselves falling behind at school. The limited opportunities to build friendships create the potential for the development of behavioral problems. After graduation, these students often find it difficult to enter the workforce. 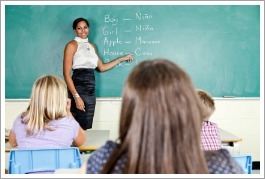 Bilingual education has been a part of America’s heritage since its inception. When settlers reached the New World, they encountered dozens of Native American tribes, each with their own language; the settlers themselves spoke at least 17 different languages. The 18th and 19th centuries continued to see the influence of immigration, to the point that legislation was passed to allow for the establishment of schools in languages other than English. During the years leading up to World War I, immigrants in urban centers were encouraged to abandon their native tongue and assimilate into the English speaking culture. The political upheaval in Cuba during the 1960s brought waves of immigrants into Florida, which led to changes in legislation and classroom strategies that continue to shape how ESL is taught today. By becoming an ESL teacher you can help students overcome English language barriers, so they can enjoy the opportunities afforded to their peers. You’ll watch students grow in their command of the English language, succeed more readily in mainstream classes, build more and stronger relationships, and discover more options and a brighter future. Who benefits from ESL classrooms? The Federal Interagency Forum on Child and Family Statistics reports that in 2009, 66 percent of school-age Hispanic children and 63 percent of school-aged Chinese children speak a language other than English at home, compared to six percent elsewhere. As a result, 16 percent of Asian and Hispanic children who don’t speak English at home have difficulties in school. In general, there are two types of ESL classrooms. In communities where the majority of the students share the same ethnicity, are fluent in their native tongue, and have a working but limited understanding of the English language, bilingual classrooms are established. This situation places a demand on the teacher to be fluent in both languages. However, the majority of ESL classrooms are exclusively English speaking. This allows the teacher the liberty of working with students of varied ethnicities, and forces students to be immersed in the English language. Teachers in these learning environments focus on expanding the student’s vocabulary by teaching basic grammar. Initially, this occurs through teaching conversational English. ESL teachers use experiential learning exercises which encourage students to learn the names of basic objects. Conversation skills are developed by asking each member of the class to respond to everyday questions. As students develop, the teacher shifts the emphasis to more academic English, at which time students are taught to read and write in the English language. Some school districts have the resources to provide computer workstations for students so they can work independently, using software designed to help with language acquisition. Like all teachers, those aspiring to become ESL teachers should develop patience, instructional skills, and communication skills. ESL teachers should be adaptive and creative as well, as they’ll be constantly assessing their students and adapting their curriculum and teaching methods to meet their needs. ESL teachers will also need to be resourceful, as they frequently find themselves working in under-resourced school districts. According to the National Center for Education Statistics, 27 percent of schools with bilingual and ESL teachers report having difficulty filling these positions. The data also suggests that the demand for ESL teachers is higher in urban centers and in regions with high levels of immigration. People acquire new information by being exposed to it in a number of ways. In any language-acquisition classroom, this occurs by practicing four phases of language: Reading, writing, listening, and speaking. For example an ESL teacher working with primary-aged children can lead a lesson on “common things found in a school classroom.” The teacher will hold up an object and say its name—e.g., “This is an apple”—and then ask the student what the object is. The teacher might then ask the students to practice writing the work “apple” several times, then later on, read a simple story about a child who brought an apple to his teacher. By experiencing English words through a variety of contexts, the child is more likely to learn and retain the words and their meanings, as well as use them properly in context. According to a 2009 study, the percentage of school-aged children who don’t speak English at home varies regionally. The Midwest has the lowest percentage of children in this situation at 12 percent, while that percentage climbs to 34 percent in the West. Not surprisingly, the percentage of school-aged children who struggle with English stays roughly proportional to this, ranging from three percent in the Midwest to eight percent in the West. These statistics suggest that the demand for ESL teachers will only grow as America becomes more diverse. Also, according to the National Clearinghouse for English Language Acquisition (CAELA), more than 1.1 million adults were enrolled in some form of ESL class during 2006-2007. CAELA also reported that during the same period, roughly 46 percent of all those in adult education programs were also enrolled in ESL classes. The growing immigrant population enrolls in these federal and state funded classes to improve their chances of entering the labor force, become part of their surrounding neighborhood, and maintain relationships with their children as they assimilate with the surrounding culture. It’s not uncommon for ESL teachers in the public school system to find supplemental income as ESL tutors, or to teach summer school to ESL populations. Also, ESL teachers are able to find employment tutoring college students, as well teaching in adult classrooms and tutoring adults. Adult programs are generally funded federally; thus, employment might be found through a variety of non-profit organizations. ESL certified teachers are also desirable hires for other migrant education programs. According to the Bureau of Labor Statistics (BLS), the average median pay for teachers varies by grade level—ranging from a median pay of $46,530 for adult literacy and GED teachers to $53,230 a year for high school teachers. More experienced teachers can potentially earn upwards of $80,000, according to the BLS. Typically, these teachers with higher-end salaries are also department leaders or administrators. It’s also possible to increase one’s entry-level salary by earning a master’s degree in education. Entry-level teachers with a master’s degree typically see salaries 15 percent higher than those without master’s degrees. Every state demands that public kindergarten, elementary, and secondary school teachers hold at least a bachelor’s degree in education. Some states’ require that teachers also major in a specialized content area such as reading, math, or history. In addition to academic work, future teachers are also exposed to field work such as student teaching, to put their newly developed skills into practice. Many states require continuing education after the teacher becomes licensed, including the requirement to earn a master’s degree. In addition to the requirements of basic certification, ESL teachers are also mandated to earn an ESL certificate. However, this requirement is sometimes waived in school districts where the number of fully qualified teachers is lacking. For specific information on certification and licensing requirements in your state, be sure to visit www.teaching-certification.com.